PBS sent me an advance copy of the NOVA program 'Hubble's Amazing Rescue' which airs Tuesday, October 13, 2009 at 8PM Eastern time on PBS. At first I thought, "Great, another hour-long show of guys practicing space walks in a swimming pool". I couldn't have been more wrong. What you get is truly an insider view to the preparation, dedication and innovation required to carry out the most sophisticated set of space walks and tasks ever performed by human beings in space. These astronauts spent two years of their lives preparing to repair and upgrade mankind's favorite telescope for the last time ever. Like Super Bowl contenders, when game day comes you get one chance, that's it. 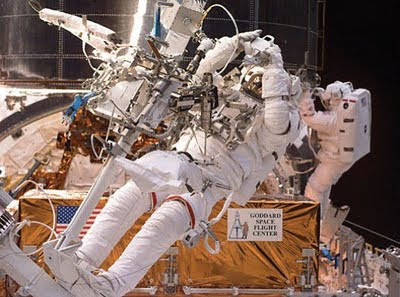 The stars of the show are undoubtedly the two astronauts who made the space walks and Hubble herself. But like any great team, it takes dozens to hundreds of people to make it all work. I actually enjoyed the underwater practice sessions. We got to see how they made a plan, ran through it underwater, made corrections based on practice experience and revised the plans. The engineers who were designing and redesigning the special tools sometimes worked day and night to get things ready for the next practice session. 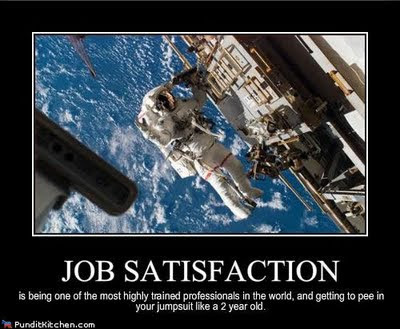 I'd never thought much about it before, probably because I didn't realize just how long some of these space walks lasted, but these astronauts spend up to eight hours floating around in those suits and you can't take a ham sandwich with you for lunch. There are no potty breaks either. All this reminded me of one of my favorite captions of all time. In space you wear some mighty thick, clumsy gloves. Yet these people were tasked with removing dozens and dozens of little screws without dropping a single one. A loose screw inside the space telescope would be a disaster. Speaking of disasters, just going up in the space shuttle takes a special kind of person. You have a one in seventy chance of not coming back. The movie takes us through the two year preparation. We get to know these brave astronauts and many of the ground team. Finally, launch day comes and everyone is ready to go. 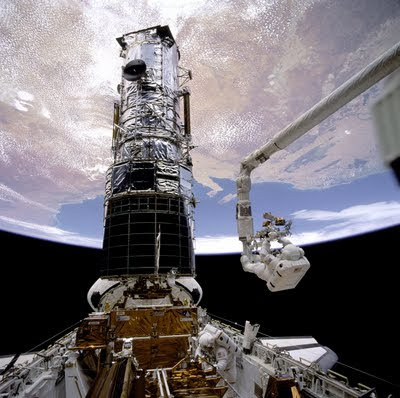 Once in space, the shuttle crew wastes no time grabbing Hubble and gets down to business. Seeing the giant space telescope sitting in the cargo bay of the shuttle always surprises me. The Hubble Space Telescope is gigantic! I don't know why, but I never think of it as being that huge. After all, it's a satellite right? As with all the best laid plans of men, not everything goes off without a hitch. Obviously, we are beginning to see the results of this servicing mission in new images from Hubble, so you know they completed the job and made it back home safely; but there are some suspenseful moments in the mission that I will not spoil for you. Watch the movie Tuesday, or make sure you record it on your DVR. You won't be sorry. It's an amazing story about amazing people doing amazing things to keep our most amazing telescope ever going for a few more amazing years. Two big thumbs up from the Simostronomer.